The number of injuries at the 2015 World Cup are "not out of step with the norm" according to World Rugby, amid concern at the number of players who have been ruled out the tournament. Twenty-two players have so far had their involvement ended by injury. That includes Ireland's Peter O'Mahony and a host of Welsh players, including latest victim Liam Williams. "Injury rates at the elite level of the game have not increased since 2002," said a World Rugby spokesperson. "It is too early to make comparisons [between 2015 and other World Cups] as it is usual to see fluctuations during an event, but injuries do not appear to be out of step with the norm. "There is a definite swing. World Rugby dispute this, saying that injury rates need to be analysed as opposed to the number of players injured. Maybe we are more concerned because the home nations have been badly affected this time round." "A full review will be conducted as per usual after the tournament. Player welfare is World Rugby's number one priority." By the end of the pool stage in the 2011 World Cup, 19 players had been replaced because of injury, while in 2007 the figure was 37. Former Scotland international John Beattie told BBC Radio 5 live: "The human body has changed unbelievably since the first international in 1871 and the pitch has not changed at all. "These highly-trained, hugely-physical men are doing things they never did before. They are bending over the ball, exposing the back of their heads and necks to opponents. "You have these blokes being bashed up and most people think it is a great spectacle. When I was a boy there was film called Rollerball and it was about doing real damage to each other. It is the same fascination as boxing nowadays. It is gladiatorial. "I want to see the best players and at the moment key players in every team are being injured. We are being robbed of the best players." Beattie identified the scrum as a particular area for concern. "Because the scrums take so long you have boys who are conditioned to be explosive," he said. "We have developed a game where boys can rest and have maximum impetus. They can be 21 stone and the hits are huge. "I would red card props at the first scrum collapse and reduce each team to 13 straight away. Longer scrums mean players stay stronger for longer and it is a collision game." 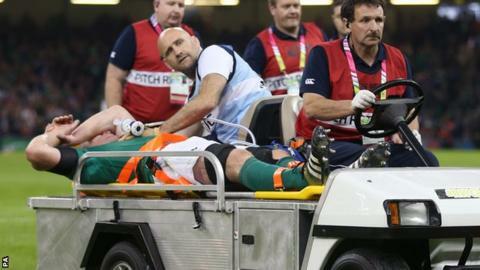 Brian O'Leary, the head of medical services at London Irish, told 5 live: "It is difficult to compare the injuries now with 10 years ago because it was a completely different sport. And the injuries are actually less now than then. "New Zealand, Australia, South Africa, France, England, even Ireland up until last night hadn't had a huge amount of injuries. Wales have had a huge amount. You have to ask, 'is that unlucky?' Why have others not been affected?'" Northern hemisphere countries have suffered more injuries during the current World Cup than their southern counterparts and O'Leary suggested that their tactical approach may be one of the reasons. "The philosophy of the coaching is important," he added. "At London Irish we have a new southern hemisphere coaching set-up. "We had a couple of injuries and I was reviewing the footage and they said the player could have passed instead of looking for contact. They felt the northern hemisphere teams look for more contact." Learn more about the changing shape of rugby players through the decades in the iWonder guide.